The IDF's 'Windbreaker' tank defense system works again, as terrorists' anti-tank missile narrowly misses troops. 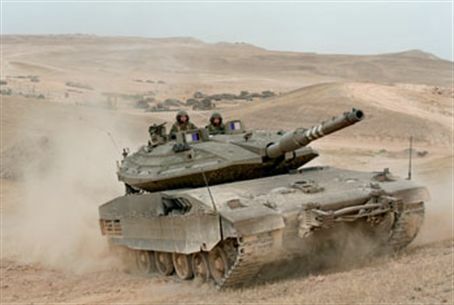 A group of soldiers survived an attack on their tank Sunday in what has been touted as a second success for the IDF's 'Windbreaker' tank defense system. The system went into action as terrorists fired an anti-tank missile. The system determined that the missile was en route to narrowly miss the tank, so it did not blast it out of the air. However, it enabled soldiers to locate the source of the attack before the terrorist cell could fire a second time. Soldiers then returned fire, ending the attack and critically injuring one of the attackers. Three weeks earlier, 'Windbreaker' (Meil Ruach) fired at an anti-tank missile in mid-flight and blasted it out of the air after determining that it was on a path that would end in a hit on the tank. IDF spokespersons noted that Gaza terrorists have stepped up their efforts to harm soldiers over the past several hours. Terrorists in Gaza have carried out several dozen attacks in the past two days, most of them on Saturday.